Venezuela's communist regime on verge of collapse - RKMBs v9.0: Rob's Damn Boards .:|:. This has been going on for over a week now, but appears to be approaching the breaking point. The U.S. currently has a press conference with John Bolton announcing economic sanctions. After massive protests of Venezuela president Nicolás Maduro yesterday (Jan. 23), national assembly speaker Juan Guaidó swore himself in as the nation’s interim leader, giving the South American country two heads of state. Shortly after, the US recognized Guaidó’s move, followed by 11 other nations—Argentina, Brazil, Canada, Chile, Colombia, Costa Rica, Guatemala, Honduras, Panama, Paraguay, and Peru—as well as the EU. The US stance prompted Maduro to issue a 72 hour window for American diplomats and consular staff to leave the country. “The imperial government of the United States is leading a coup attempt against [Venezuela] in order to install a puppet presidency…” said Maduro during a live state broadcast. Russia, Bolivia, and Cuba issued statements supporting Maduro as the legitimate president. Meanwhile, China issued a statement opposing foreign interference in Venezuela. “I want to emphasize that outside sanctions or interference usually make the situation more complicated,” foreign ministry spokeswoman Hua Chunying said at a Beijing briefing. 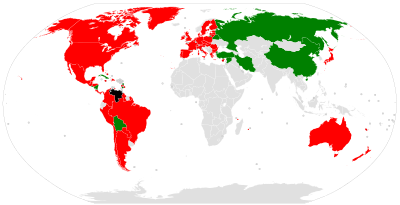 The nations supporting Maduro over Guaido are either communist regimes, and/or nations that kneejerk oppose any policy the U.S. supports. How can the U.S. be putting sanctions on Venezuela's socialist regime when Russia supports them? I thought Trump was Putin's puppet? The administration has been good at following many Obama policies but Trump has shown personal disdain for much of it. We know Putin helped Trump in the election because he saw Clinton as a foe. In another time that would have been a plus for Hillary. Instead it just raised Putin's popularity within the GOP. You guys are getting lost on who is our true foe. 1) Trump vastly stepped up the war in Iraq/Syria against ISIS, and even killed about 150 Russians in one raid, where the Russians were helping to kill our Kurd allies. ISIS has been annihilated in Iraq/Syria, not contained or reduced, ANNIHILATED. Something that never would have occurred under Obama. 2) Trump also stepped up support of Ukraine against Russian invasion. Whereas Obama did virtually nothing to help Ukranians resist Russian invasion. Obama sent them some blankets and canned food rations. Obviously Trump has done vastly more than Obama to support Ukraine's ability to deter and push back invasion. 3) If Trump was on the Russian side, he wouldn't have hit them where it costs Russia the most, in U.N. sanctionss against Russian oil, Russia's largest source of revenue. Trump exposed Europe's dependency on Russian oil, and has set up the U.S. to replace them as Europe's oil and natural gas supplier. 4) Trump has also taken steps to limit Russia's banking finances in Western nations, in response to its aggression in Ukraine. So I don't really care what the 92% anti-Trump Washington Post and other DNC Newspeak media have to say trying to spin it against Trump, those are the true facts. It looks like the communist Maduro government is reaching the breaking point in Venezuela. There is an increasing push to bring humanitarian aid and food to the Venezuelan people, and it is reaching the point where the Venezuelan military leadership will have to either let them in, or support Maduro by firing on their own people. There is also an interview with the neighboring Colombian president on his perspective and actions regarding the situation. And he suggests, what is mostly common sense, economic investment by other nations in central America, creating business and jobs in the region to stop the exodus out of the region looking for better opportunities. I was surprised, he said Colombia has been second only to the U.S. in foreign investment there. But he encourages more. It made me think that a percentage of Central American immigrants must be going south to other hispanic nations. If I were hispanic wanting to leave Central America, I would want to immigrate to a spanish-speaking alternative nation similar to my own, such as Costa Rica, Mexico, Colombia, Venezuela, Panama, Peru, Ecuador, Bolivia, Chile, Uruguay, or Argentina. I'd say Brazil, but they speak Portuguese, so that would be as much of a language barrier as moving to the english-speaking United States. I'd like to see news coverage of what percentage of Central Americans leaving are going to somewhere other than the United States. Maybe the majority beeline to the U.S., but some of them must be going elsewhere too. And we've all seen that the people on Tijuana are no more pleased with thousands of illegals coming into their country than we are here. I jusr watched an interview with Debbie D'Souza, who is a native of Venezuela who fled the country when Hugo Chaves took over. She described her country at that time being as prosperous as the United States. Then they started "tax the rich" and wealth redistribution, that only tore down the rich but didn't elevate the poor. Then they took away guns from citizens, and nationalized all business, including nationalizing Venezuelan media under complete control of their socialist/communist government. Now people are literally starving and have no way to defend themselves against their authoritarian leaders. And while dissent is rising, the government in its death throes have in recent weeks killed hundreds of dissenters. They are also militarily preventing humanitarian aid to feed their citizens, coming from Colombia, Brazil and other neighboring nations, from entering Venezuela. D'Souza also says that the current Venezuela regime presents a direct threat to the national security of the United States, as they host Hezbollah training camps, are a conduit for islamic terrorists on their path to illegally entering the United States, and are allied with the Iranians, who are seeking to buy uranium from Venezuela. And we all know what Iran would do with that uranium. I've seen her interviewed several times on the subject of Venezuela in recent weeks, and knew she is a Venezuelan exile. Not until I googled her name did I know she's the wife of Dinesh D'Souza. She's passionate in her warning of what happened to her country, and that the same could happen to the United States. And the stated policies of the rising Bolsheviks in the Democrat party are certainly clear they want follow an identical path here in the United States.